I've been curious to revisit Slither ever since director James Gunn tried his hand with Marvel and made Guardians of the Galaxy. While I'm afraid to rely too heavily on comparisons to such a new film, essentially Slither feels like it has slightly more personality and slightly less polish. This is definitely a low budget feature by comparison, but as an homage to classic horror b-movies I wouldn't want it any other way. 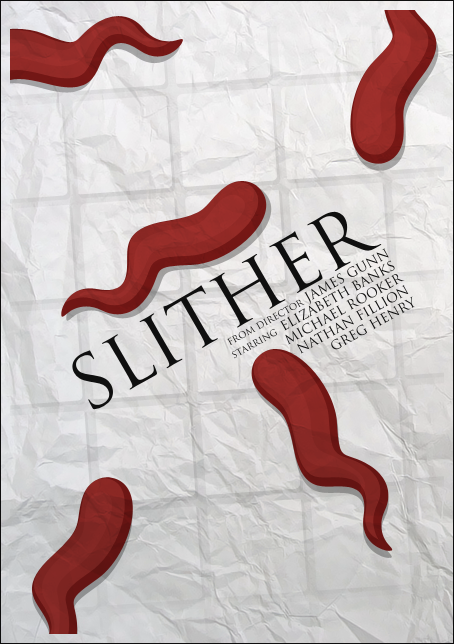 Slither is about an alien race which crash lands on Earth in a meteorite—mimicking the openings to 50's classics The Blob and War of the Worlds—and begins mind-controlling its inhabitants. Their first victim is Grant Grant (Michael Rooker), the philandering husband of Starla Grant (Elizabeth Banks). But once in command, this alien being experiences something it wasn't prepared for: love. It experiences Grant's love for Starla as if they were meeting again for the first time, and through its hive-mind-like telepathy, everyone else it takes over falls in love with her as well. It's your typical fantasy of being loved by everyone around you, except that everyone around you has an extraterrestrial worm inside their head eating their brain. Gunn's sci-fi horror throwback is campy, atmospheric, and deliciously repulsive. Elizabeth Banks stands out as an ordinary woman forced to become a badass by extraordinary circumstances, and Gregg Henry steals a variety of scenes as the slimy mayor Jack MacReady (an explicit reference to John Carpenter's The Thing). The lighting is wonderfully dark and moody, offsetting the film's perversely comedic script with a threatening atmosphere. The mix of practical and digital special effects are hit or miss from scene to scene, but even when they're obviously computer-generated they still contribute to the light-hearted goopiness of the film. Occasionally it seems to struggle with its tonal tightrope walk between horror and comedy, and some of the pacing feels a little odd to me. But otherwise Slither is a gleefully exuberant tongue-in-cheek panegyric to the b-movie era, and Gunn's love for his craft makes this a memorable entry into the genre in its own right. This time through the film, I watched it with audio commentary from James Gunn and Nathan Fillion. Together, the two are fun to listen to and they share a lot of insight into what the conditions were like on set. Gunn also talks a lot about how they did the special effects, as well as sharing some of his frustrations with the film (e.g. assistant directors lighting scenes differently; running out of money toward the end of shooting). There's a lot of detail here, so I would give this commentary a hearty recommendation to anyone interested (I believe it actually comes on most DVDs—I don't have a special edition or anything).